The Occasional Sale seems to be more popular than ever. If you are new to the concept, these are stores open occasionally (once or twice a month for instance) for several days in a row. The dealers restock daily while they are open, so selections are always changing and new treasures await every time you stop by. We have a few in Jordan too, and this weekend The Corner Peddler is open. The Corner Peddler features primitives, some antique and some reproduction. Among the treasures you’ll find furniture, wall hangings, dolls and other home decor. One of my favorites are the battery operated candles – they really look like flickering candles – we have one in the Nicolin Room. The Corner Peddler also features repurposed items like curtains made from kitchen towels, candle holders made from canning jars, and decorations made from dried fruit. You’ll be inspired. Another great thing is the sales are often held in buildings that are as interesting as the inventory. The Corner Peddler is in Jordan’s Old City Hall building, complete with bars on the old jailhouse windows. Treasure hunting in unique places creates an experience beyond just shopping. 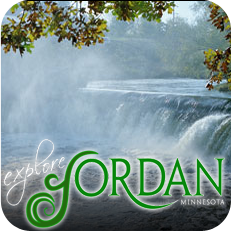 Check our Jordan Events Calendar for sale dates. It’s apple time in Minnesota – and we’ve got a great selection of orchards here in Jordan. One of the most unique is Jim’s Apple Farm, which not only carries a large variety of pre-picked apples, but also boasts of being Minnesota’s largest candy store. With a barn full of every type of candy imaginable, from those hard to find classics to the latest sweet treat, you’ll find it here. A large number of varieties is Jim’s specialty – 87 kinds of licorice, 67 kinds of root beer – and the number posted outside is always growing. But they don’t stop at apples and candy. There is a fantastic bakery baking up pies and strudels – and a pie light outside let’s you know when the ovens are filling the barn with a heavenly aroma. And there are shelf upon shelf full of every preserve or pickled food you can think of. And there’s more – Pumpkins and Gourds. And at great prices – any gourd is $1.49, and any pumpkin is $3.98. And not just the standard orange fare – but white, and blue, and knobby ones that look like they are covered with peanuts. You’ve just got to stop by! This spectacular sight of mammatus clouds came with the storms that blew through Thursday night, June 17th. Our guest from North Carolina was a bit on edge, claiming somehow she’d rather go through a Hurricane?! Not ME! Thankfully all was safe in Jordan, and our guests didn’t need to know behind which of the three doors were the stairs to the basement. Our prayers go out to those in Minnesota that were not spared the wrath of the storms though.